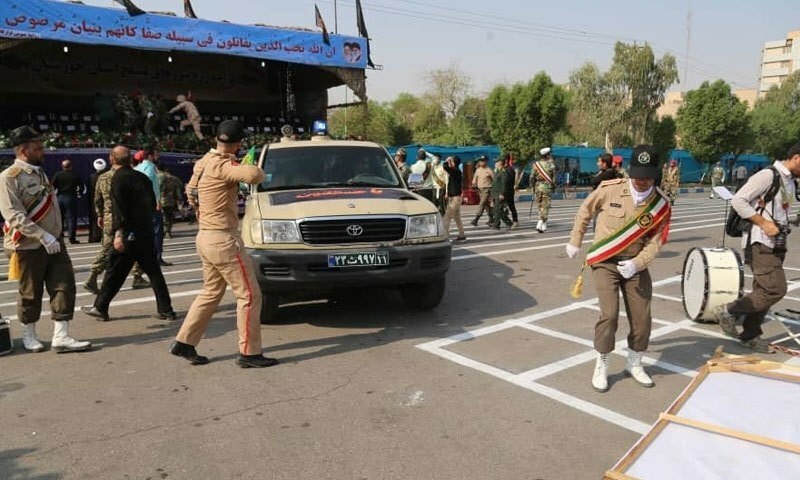 TEHRAN - A terrorist attack took place in the south-west of Iran during a military parade in which 25 personnel of the country's elite Revolutionary Guards have been killed according to Iranian local media. According to the foreign news agency (AFP), a military parade was continued in the city Ahvaz city of Iran. The military parade took place on the completion of 38 years since the Iraq-Iran war that happened in 1980. Iran's official news agency 'IRNA' reported that 25 guards of the Guantanamo Revolution killed while 54 others are injured. The report said that those who are Injured also includes women and children. According to a report, two armed terrorists started firing on the guests of the function and then the terrorists tried to attack Senior officials of Iran but the armed terrorists got injured in the counter-attack by the security. No group has yet claimed any responsibility of this attack. But it is believed that ISIS was behind this attack as the ISIS have recently launched multiple attacks in the capital cities of Iran. The Ahvaz city is a well-known oil-rich place in the south-west of Iran. It is very uncommon that the Senior Iranian Officials are being targeted by the Armed terror groups.